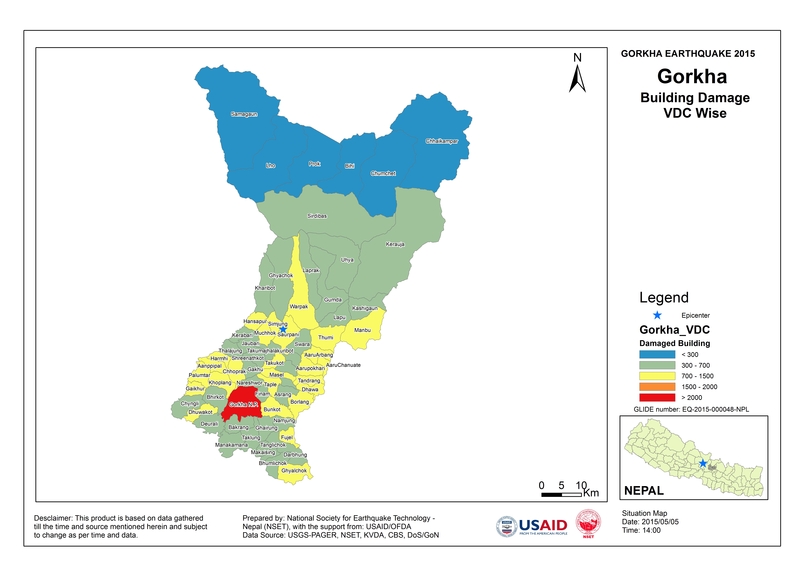 The 25th April 2015 Gorkha earthquake (magnitude 7.9) killed over 9000 people and injured more than 23,000, affecting some 8.1 million people, half of whom have been displaced. It was the worst natural disaster to strike Nepal since 1934, and was followed by several large aftershocks; the largest of which, on May 12th, reached magnitude 7.3. The earthquakes triggered huge avalanches at Mount Everest and Langtang, and caused landslides across the country, bringing widespread devastation to homes, villages and the already limited road infrastructure. It destroyed many high-rise and historical buildings in the Kathmandu Valley, and collapsed almost 90% of the homes in Gorkha, Sindupalchok, Nuwakot, and Dolkha district. In Gorkha, 95% of schools have been seriously damaged, rendering them now unusable. People fled their homes to take refuge in makeshift shelters put together out of whatever materials they could salvage. Even now, many are still too frightened to sleep in their damaged houses for fear of further tremors. Nepal’s weather is varied: from dry, dusty and cold winters to the heat, humidity and intense rainfall of the monsoon; each season poses different challenges to these farming communities; even more to those in shelters. Add to this the pressures of eking out a living from the land, and crises of malnutrition, sickness and exposure are never far behind. With the daily struggle for food characteristic of subsistence farming, and without extra money to begin rebuilding, entire families remain homeless. According the Asian Development Bank, the overall damage is reported at $6.7 billion – around a third of the entire country’s GDP of $19.2 billion. The Gorkha Foundation is a 501 (c) (3) nonprofit, grassroots organization whose purpose is to support initiatives that reduce poverty and inequality by making sustainable improvements to the living conditions of the poor and marginalized in the Gorkha region of Nepal.